It was a beautiful weekend, but we forgot the camera until the very end (Angela without a camera? unthinkable!). We went to a pool party on Saturday and Doug took Adam to Tutto Italiano with some other friends on Sunday. Here are some pictures from last year's show. I tried to get tired, grumpy Dova to spend some time outside, and I finally convinced her by having a picnic in the front yard. We had chicken, grapes and yogurt among the nosey cats and hungry ants. I tried to settle her down for a nap, but Dad and Adam came home. 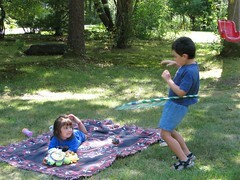 Here is Adam showing off his hula hoop skills. 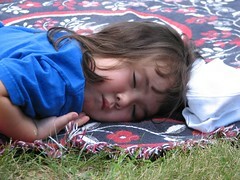 Finally she crashed and slept for 3 hours. The lighting was just beautiful in these shots, so I had to post them.